The first 5Rhythms workshop in NYC to focus on visual, artistic expressions of creativity, 5R Visual, took place at the Joffrey in the West Village on Sunday, January 10th. The workshop—IN Sight: In Pursuit of Magic—was lead by Martha Peabody, who worked closely with Gabrielle Roth, the creator of the 5Rhythms practice, for 39 years. Arriving slightly late and stepping into the already flowing room, Martha approached me and whispered, “I’m so glad you’re here! Do you have an object that represents the present that you want to add to the table?” I nodded and went to the bag of objects I had gathered to bring to the workshop. I had received an email the night before letting me now that I should bring an object that represents the past, one that represents the future, and one that represents the present. I gathered many more than three things, unsure of what I wanted to put forward. I spent a few moments pondering my options, then selected a small lighter with rainbow colors and a graphic of a tiger on it and added it to the front table, which Martha had already graced with numerous items devoted to the faculty of sight. After the opening wave of the IN Sight workshop, with Martha’s on-mic suggestions and music offered by Daniela Peltekova, we set into an investigation of the objects we chose to represent our present. Martha offered many phrases about past, present and future, interspersed with suggestions about the rhythms themselves. She periodically suggested we partner, but moved us in and out of partnership throughout the day. After the conclusion of the wave, we each placed our object on the dance floor. Then, we walked around and chose one object that appealed to us. I selected a circular disc, with a Prussian blue ground and a metallic gold sun painted on one side, and a metallic gold moon painted on the other side. Then, we arranged ourselves like an audience, and took turns, three at a time, standing to face the audience with our selected object. We each had to take a shape—and in some cases a repetition—arising from our selected object. Inwardly, I groaned. As I have written about recently, taking a shape is often challenging for me. I watched with interest as the experience unfolded, hesitating to step up. When I finally did, I took a shape that was somewhat familiar to me, not necessarily what was arising from the object that I was in temporary possession of. This seemed a little easier than usual, but I was still glad when my turn was over and the exercise dissolved. Because I knew I would be attending the IN Sight workshop the same day, I was lighter than usual with my expectations for the class with Simon. Part of me is very invested in raising him with the tools of 5Rhythms. If he doesn’t want to engage with the activities in a given class, it can feel like an affront and make me nervous. I beseech him, sometimes, hoping to engage him. Also, I often want some kind of “experience” for myself, reluctant to give over to his needs completely. Simon wanted me close for most of the class, though he did range through the room at times. He started out huddled near one of the room’s center columns with a small pile of toys and some peanut butter and jelly sandwiches he was working on. Gradually, he stretched out on the floor, and began to circle on his side—similar to a kind of movement I have been experimenting with lately—keeping a watchful eye on everyone around him. As he got more comfortable, his movements grew, but he continued to want me close. The most active we became was in a kind of spinning, bounding breakdancing that had my knees sore for several days after. He kept stopping in front of me and pointing emphatically to me, then to the ground, asking me to please get on the ground with him. Most times I obliged. As the music slowed, Simon lay on top of me, both of us facing up, with Simon’s upper back arched over my bent knees, in a shape he has loved since he was pre-born. We were in the closest gesture we can now get to of him being born. I reflected on how close we still are, and how surreal it is that the entirety of this little son once fit completely inside my small body. Simon made it through almost the entire class. During Chaos in the second wave the room got very energetic and some dancers started to let out screams. Simon stopped in front of me, looked at my face and pointed abruptly to the door. We stepped out and found a girl of about 8 or 9 with her mother, who also wanted to leave the studio during Chaos. There, too, we found Simon’s father, who was there to bring Simon home when I continued on to the IN Sight workshop downstairs. Simon and I stepped back in for a few more turns, then concluded. I felt proud and content, and smiled, silently mouthing “Thank you” to Jilsarah Moscowitz, who had taught the Sunday Sweat Your Prayers class that day. Which brings us back to the IN Sight workshop—the first ever workshop in NYC devoted to exploring the rhythms through visual expression. After presenting our borrowed objects and our chosen shapes and repetitions, we took a break. Small talk seemed incorrect; and I slipped out to buy a tea, hoping it would combat the tiredness I was starting to feel. I returned to a miracle—a spectacularly manifested double rainbow over Manhattan, viewed from the fourth floor windows of the Joffrey on 6th Ave and 10th Street, facing north. 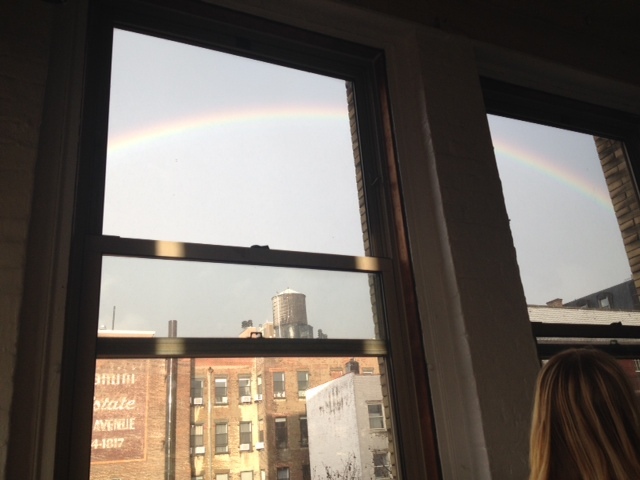 Earlier, Martha had shared that she had seen a rainbow on her drive from New Jersey to Manhattan that very morning. “A rainbow in January,” she proclaimed with wonder, gesturing one arm in an arc. I pushed the window up, climbed onto the sill and bent double over the window guards, trying to get a photograph of this miraculous phenomenon, then sitting and observing it with reverence. Conversation lingered as Daniela began the music; though I moved immediately to the center of the room and started to twist and rotate, my body glued down, arching my back and using the crown of my head as an axis to shift into a new movement, continuously moving, in Flowing. Martha gathered us into a circle, then asked several people to step into the center. She revealed that all who were in the center were 5Rhythms teachers, some of many, many years—“lifers,” she joked. Then, she asked them to simply walk, changing direction and looking for the empty space. She asked us to take a step in. Then another. She described this as the most basic of all 5Rhythms exercises; and I reflected on the beautiful humility of Flowing. The un-flashiness of it, fundamentally. She asked us to take another step in and the center became more and more compressed, determined. Martha, described as an historian of the 5Rhythms by one highly respected teacher in attendance, shared the story of how this exercise evolved. Originally called “The Porpoise Dance” it arose in the early years of the work Gabrielle was doing with mental patients, when just getting them to move and shift directions was momentous. With seamless prompts, Martha wove the rest of us into this exercise of walking, moving into empty space, and changing direction together in the field of Flowing. As the wave unfolded, Martha offered suggestions about past, present and future, setting us up for the visual experiments we would undertake shortly. The room that was lively in Flowing became rooted in place in Staccato for some reason, perhaps preparing to choose a spot for our visual creations. At last, Martha invited us to set to arranging our objects and materials in a visual representation that was meaningful for each of us. I had my eye on a small set of metal stairs that leads to the studio’s fire escape. Laying out many of the materials and objects I brought along, I went to plug in a long strand of white Christmas lights. Finding an outlet, I climbed under the ballet bar, which was laden with coats, sweaters and bags, and plugged in. Nothing. Hmmm. Was it the outlet? The lights? I traversed the room and tested them in a different outlet. This time they worked. I had to scrap my idea and relocate. Before I gathered my things once again, I opened the book, “Maps to Ecstasy” by Gabrielle Roth to a passage about the limitations of ego. And again, to another. In a different part of the book. Most people were finalizing their choices and I still hadn’t settled in to work. I traversed the room diagonally again. The outlet I wanted to use was across another dancer’s work. I asked permission in a whisper, but I couldn’t find a way to cross her work without interfering with it. Finally, I found another outlet that worked and plugged my lights in. Next, I submerged half of the white Christmas light strand inside a large Ball Jar. As far as my objects went, that was all I had been sure of. I lay out the rest of the pile of things, working quickly to select what I wanted to include. First was a yellow-orange cloth, an orange, infant-sized tiger sock, and the little rainbow tiger lighter. I also included some orange wool, a fabric rose, and a tiny drawing of a pelvis bone and ribcage holding roses inside it. Martha had laid a number of objects we could borrow on top of the room’s piano; and I selected a little wooden man who was segmented into head, torso, upper arms, lower arms, upper legs, lower legs, hands and feet; and held together at his joints by strings. I placed him onto my shoulder like a baby and carried him gingerly to my site, placing him with care amongst my chosen objects. Martha was calling for us to begin the next segment of the workshop, and I hurriedly finalized my work. Though I never felt it was really resolved, I had no choice but to trust that it was correct in the state that it landed. Next, paper and a pen were placed in front of each person’s visual representation; and we were asked to circulate, regard each, and come up with a possible title. I enjoyed this part of the workshop, and strove to offer each presentation my relentless attention. At first, the titles I selected were simply what I observed, but as I moved around and saw how serious our lists were, I began to create poetic or humorous titles, such as “Squished Puppy” and “Homage to a Column”. At last, we began the activity of visiting each presentation as a group and listening as the person presented their three favorite titles that people had written on their paper, and adding a few words of commentary. Given the seriousness of the content people shared, I hoped that I hadn’t been facetious with my title choices. I am itching to tell you some of the stories that emerged, but as I am constrained to speaking specifically and only about my own experiences, I will just say that it was a fascinating tour; and one that required and produced tremendous attention and energy. Martha concluded this activity with a quote by Simon Weil, “Attention is the rarest and purest form of generosity,” and went on to share, with great feeling, how meaningful it was for her that Gabrielle Roth had granted her so much attention for so many years. After three more stories, the activity dissolved and we were instructed to replace our things into their bags and containers. I walked over to Martha and stood in front of her, looking into her eyes. I wanted to gulp air and say, “Help! I feel like I am going to fly off of the earth’s body! Please help!” Instead, not wanting to seem too much like a crazy person, I said, “Martha. I need to ask your advice, please. I am nowhere near ground. Do you have any suggestions?” She likely saw the panic in my eyes, and, pressing her palms firmly onto the tops of my shoulders said, “Don’t worry, I have no intention of letting anyone leave here without landing gear.” She gathered us into a closing circle before people started to drift out of the studio. As I reflected more on my own experience, I came away feeling like there is more pain in the “in between” than I have fully reckoned with. It is a lifelong process—finding the shifting point of balance between wallowing in pain and denying it. I also came away feeling like even the positive ego-stories that I tell myself—the constructions I have erected to help me to cope with trauma—no longer serve me. To have the best shot at being free, really fully free, I think I have to dismantle even these relatively positive stories, even at the risk of unleashing things I would rather keep tied down. Martha gathered us again into a circle. She coiled us skillfully into a beautiful collective spiral, than back into a circle. We ended the workshop still in the circle and each holding the mudra of humility, standing quietly together for several moments before being reclaimed by the world.